1. Mules– Mules are a trend I just need to try. I love this grey color and you can’t beat the price point! 2. 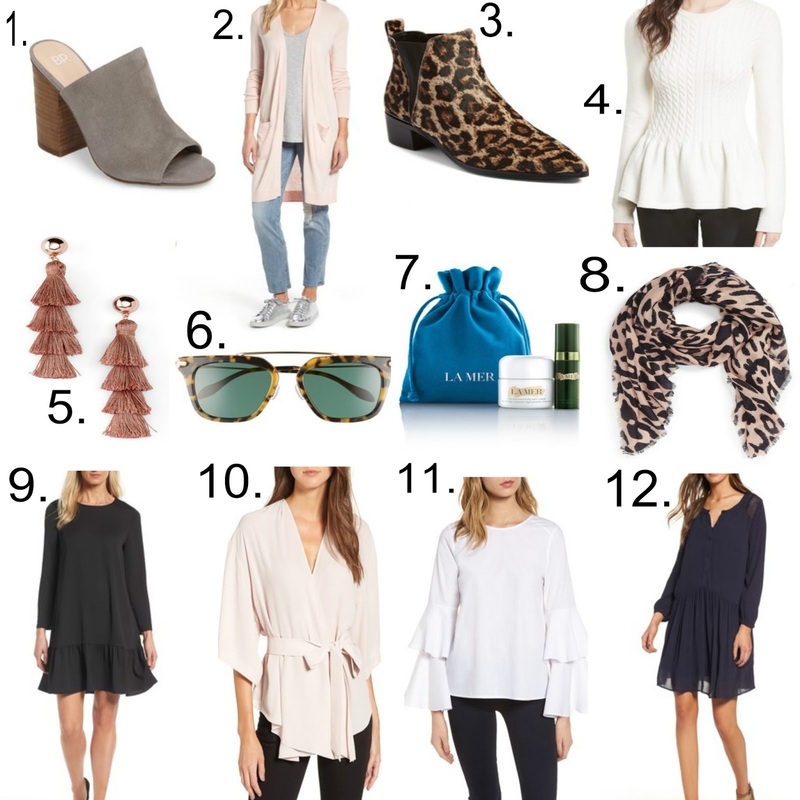 Cardigan– Always a staple, I literally live in these all year round in California. I was impressed with the color selection this year and am excited about how lightweight this one looks. PS- these always sell out! 3. Leopard Booties– This bootie shape is where things are headed this Season. I bit pointier, edgier and how cute is the leopard print?! 4. White Peplum– What a classic top. This is one of the more expensive tops I purchased but Ted Baker items always impress me with their quality and this is one of those items I think I’ll have in my closet for years. 5. Tassel Earrings– A must have in this rose gold hue. 6. Tortoise Sunglasses– A classic shape at an amazing price. I loved both colors these came in and it was hard for me to decide. 7. La Mer Kit– La Mer has been my night cream of choice for the last year and I started my love affair at the Nordstrom Sale last year when I got this little kit. You can’t beat La Mer on SALE! 8. Leopard Scarf– A must have for any closet. Leopard is a neutral and goes with just about everything. It’s always great to have a pop of leopard print if you’re looking to elevate an outfit. 9. Drop Waist Dress– I simply love the shape of a drop waist dress. They’re flattering on so many different body types and I’d much prefer a looser shape than tight. 10. Kimono Top– The color, the tie waist, the price. Enough said! 11. 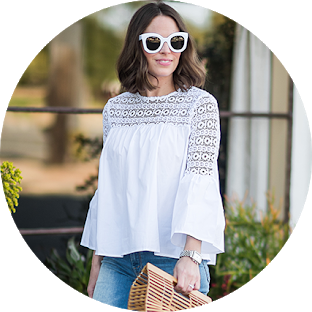 Ruffle Sleeve Top– Ruffles are here to stay, people and I love both colors of this one. I can’t wait to wear it post baby bump! 12. Navy Dress– This was one dress I got on the sale last year in a different print. The fit is so comfy and cute and I was so thrilled to see it in navy this year.